A while back Cinabar passed me a voucher by e-mail for Joe Delucci's the 'ice-cream place with the scooters in the BullRing' and I forgot to print it out. Noticing that it was the final day that the voucher was valid and that the weather was actually suitable for Ice Cream I made a special trip into town before Friday Night Magic and picked up my 4 scoops. 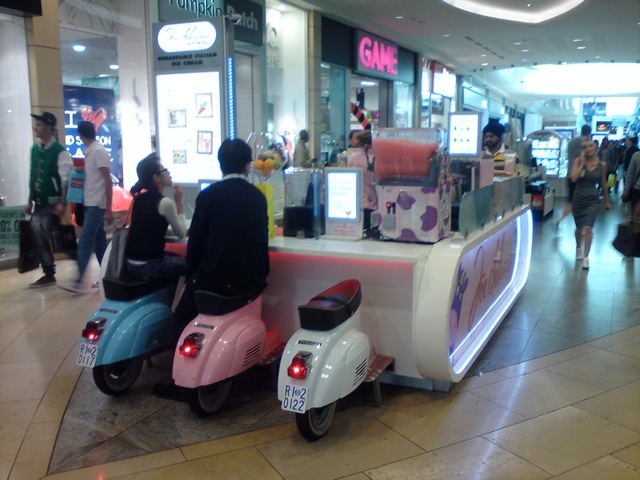 The shop itself is a bit unique, having three mopeds on the end to sit on, and being very visible and open to the passing blurred people. It's in the bit in the middle on the bottom floor and nicely close to hand when shopping. I'm not a massive fan of ice-cream when out and about, it interferes with my ninja shopping instincts and prevents you from dashing into the shops and grabbing things and escaping from the crowds. Just this once I was willing to give it a try. I selected two creamy flavours - Coconut & Oreo cookie - and two berry flavours - Raspberry and Fruits of the Forrest. I took a quick snap on the counter in case they didn't make it to my eating destination, but it came out really well and you can see the interesting textures. It's kind of like a sorbet and bizarrely the berry ones are dairy free so probably suitable for vegans! First up (as it appeared to be melting faster) I tried the coconut which was very strong in its flavour. The actual bits of coconut flesh were noticeable and added a crunch to it which I liked. The ice-cream that went behind this seemed to be a mild vanilla but was easily overpowered by the coconut. It's smoother than the Bounty ice-cream bars we get here and I'd say a little nicer (even though I love those). 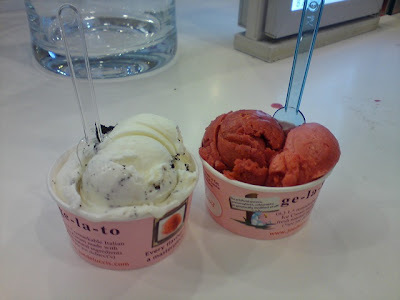 The Oreo cookie gelato was possibly my least favourite of the four but still one I'd try again. It's very hard to balance the crunch of a biscuit in something this melty, but I think the crumble effect worked. The bourbon choc flavour could have been a bit stronger for me, but it was still good. When both had melted together the resulting flavour worked well. The berry flavours were very hard to distinguish. The Fruits of the Forrest was I believe the darker of the two flavours in the picture (I forget! ), and slightly more sour in taste. It's kind of hard to distinguish the exact fauna used in the recipe but I'd say black-currant was probably the main part. It was nice, and more importantly an unusual flavour to find in an iced desert. The Raspberry was a little more fruity in flavour and recognisably Raspberry which was nice. I'd say that this was the flavour I'd be most likely to try again, it was very refreshing and certainly enjoyable. The mopeds are so cool!!! That looks awfully like the place in the news where a guy took a photo of his own daughter and got threatened by the police.